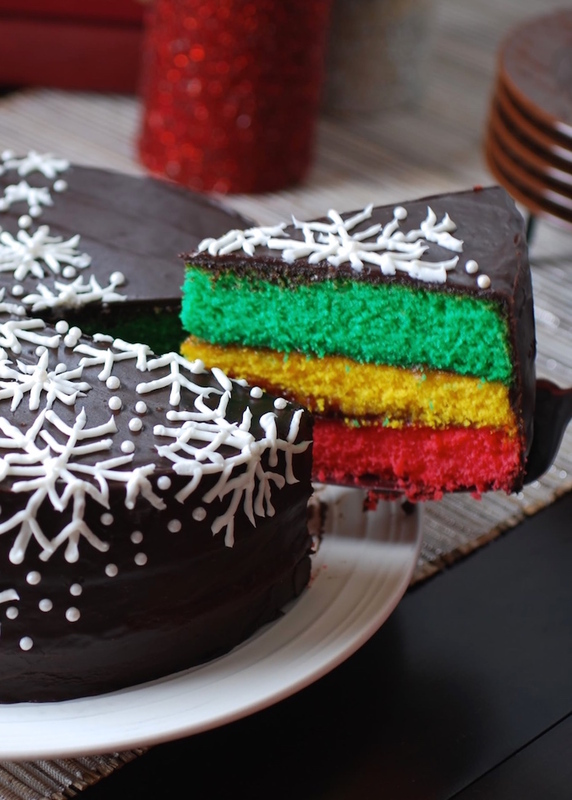 Meet my Italian Rainbow Cookie Cake! I first posted about this cake back in February 2008, just a few weeks after I started this blog, when my photography skills still justified that "mediocre" adjective in the tag line. The cake was a hit, though, and I think it's still the one about which I get the most passionate letters from readers. Mostly people like me who spent their childhoods trying to snag as many of these amazing little cookies as they could from the family dessert platter. My giant cake version was a bit of a dream come true for them (and, obviously, for me). Some of you may not know this, but my obsession with this cookie was so great that a couple years ago (back during the really bad photos days), I started a small dessert catering business centered entirely on these wonderful treats. The cookies, if you haven't tried them, consist of three layers of thin almond sponge cake filled with raspberry and apricot jam, all topped off with a layer of bittersweet chocolate filling. My little business was a hit, and at my peak I found myself baking about 30 batches of them a week. This inspired me to start offering the full-size cake versions to local customers. I've since tapered off on all the baking (really, it was just too much even for me), but I still have a few loyal customers who request my cake each year for their birthdays and other family celebrations. The recipe I'm featuring today is the version that I've tweaked and revamped over the past couple years. I've got this cake down to a science by now and figured out ways to make the process as easy and quick as possible. The round shape with three layers is also a little more versatile as it makes for a perfect birthday cake and can be decorated however you like. Sometimes I use food coloring to dye marzipan, which I then mold into little bouquets of roses or cut into hearts and polka dots that I press into the sides. Depending on the occasion or recipient, I play with the colors in the layers (think shades of green for St. Patrick's or a lovely rainbow of pastels for Easter). I even make a version filled with lemon curd and topped with white chocolate ganache, although we'll leave that for another post. I served this cake on Sunday at my fake-Thanksgiving along with anise-scented poached pears and fresh kiwi sorbet; definitely not traditional holiday desserts by any means, but delicious and festive nonetheless. 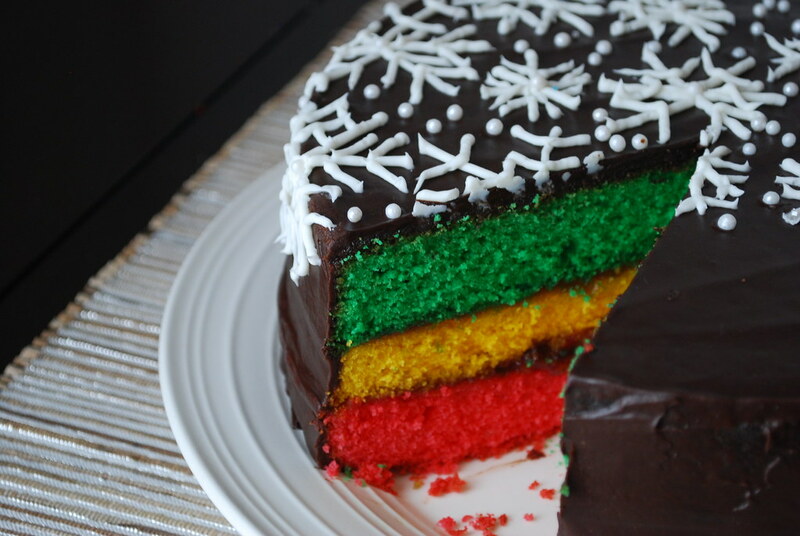 Because of the brilliant colors, I think this cake would be particularly suited for the Christmas or New Years dessert table. It certainly may not be the most elegant or the fanciest of my dessert recipes--no crushed macadamia nuts, saffron, or chardonnay in this one--but it's probably one of the most fun. And your guests who have sentimental attachment to the traditional rainbow cookies will absolutely appreciate it. Oh and please don't think this is just about nostalgia and novelty! This cake really is damn good. Moist spongy layers rich with almond are accented by high-quality apricot and raspberry preserves (you'll want to splurge on a good brand like Sarabeths or maybe even something fancy and French. Of course, good ol' Smuckers works too!). The frosting is a simple bittersweet chocolate ganache which can be left plain or decorated as you like with white frosting and pearlized sugar beads. However you end up serving it, you're guaranteed to end up with a cake that's festive enough to capture the imagination of the adults in the room, while simultaneously delighting the children. 1. In the base of an electric mixer, cream the butter and sugar until fluffy. About 5 minutes. Add the eggs and continue to beat for 3 more minutes. Add the grated almond paste, almond extract, and milk, and beat until well combined. 2. In a separate bowl, sift together the flour and baking powder then slowly add to the almond paste batter and mix until combined. 3. Separate the mixture evenly into three bowls. Dye each bowl a different shade (one green, one yellow, one red). 4. Pour each color of the mixture into individual pans making sure to smooth out the top. Bake at 350 degrees for approximately 20-25 minutes or until a cake tester inserted into the center comes out clean. Remove from the oven and let cool for 5 minutes before inverting onto a cooling rack. Remove the parchment paper and let cool completely. 5. While the cake is cooling, prepare the ganache by heating 1 cup of heavy cream in a small saucepan just until bubbles start to form around the edge. Turn off the heat and pour over the chocolate in a large bowl. Stir continuously until melted completely and smooth. Let cool to room temperature. 6. Start with the pink layer of the cake and spread with the raspberry jam until it nearly reaches the edges of the cake. Top with the yellow cake. Spread this with the apricot preserves. Top with the final green layer. 7. Use a spoon to pour the ganache over the cake, using an offset spatula to even the sides and make sure the cake is completely covered. Use as much ganache as you need. Let sit at room temperature in a cool spot for 1-2 hours until completely set. Decorate the cake as desired (optional). Just found my dessert for Christmas dinner. My kids LOVE those cookies. This is so funny, and so delish looking! How did you do those gorgeous snowflakes? Celeste: For the snowflakes I simply used pre-made DH frosting (shhh!) that I put into a piping bag with the smallest round tip I had. I first piped starbursts with 6 points and then went back and added little "branches" to each point. They didn't come out perfectly, but I consoled myself with the knowledge that REAL snowflakes aren't perfect either. It helped to just google image "snowflake" to get an idea of what they should look like. The dots were little sugar pearls that I bought at Williams Sonoma. Gorgeous! It's officially on my list to try now! This is such a fantastic looking cake!! I really want to try this for Christmas! I voted for you! You've got my vote. New Year's Eve dessert for certain. If you'll bake it, I'll pop across the Hudson to pick it up!!! Having partaken of this exact cake pictured above, I can say with certainty that it's way better than the cookies you grew up with. WAY better. I'm embarrassed to say that I've ever had those italian rainbow cookies, and I lived in New York for four years! Shame. I'll just have to try your recipe! Good luck with Bon Appetite! This cake looks adorable!! I will definetely try it very soon. Yum! 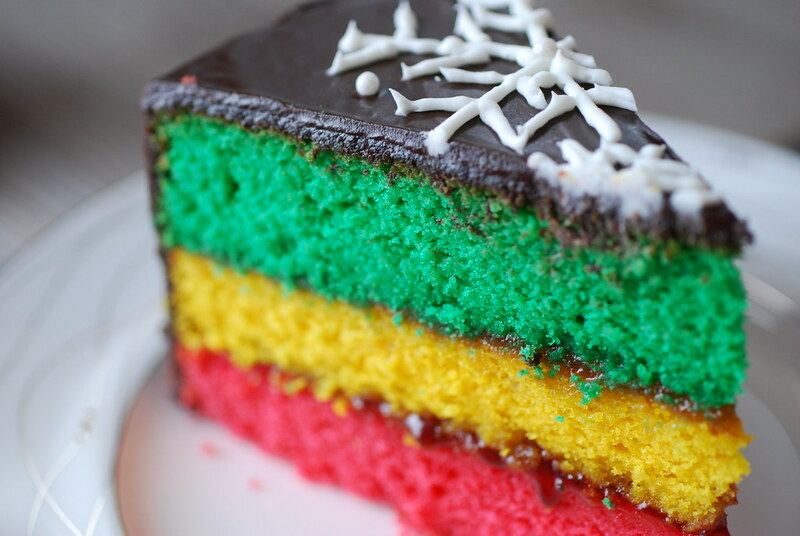 Ive been wanting to make your older rainbow cookie cake for almost a year but have never found proper almond paste where i live. My question is which cake do you think is the best the round cake or square version you made a year ago. Do they both taste pretty much the same? i see you dont use marzipan in this version. Could you give an estimate of how much food coloring you add? I always have trouble estimating how much the color will change when it bakes. This is a beautiful cake! I hope you win! Looks like a winner to me. so beautiful. this is truly beautiful - my Nonna would be proud if I made it! Made this last night and got devoured at work today. And I'm not a baker but it was sooooo good. Going to try somof the others on here. I made this cake last night, it tastes gorgeous but my colours turned out a bit wonky! How much food colouring should I be putting in? D you use powder or liquid? The batter look fairly vibrant before baking, but now my layers look like pastel shades! Thanks for the wonderful recipe, but would love to try it again with the eye popping colours you managed! I started an account on Bon Appetit just to vote for this cake, but looks like I'm a month late and a dollar short. This is one of the prettiest cakes I've ever seen. I may have to try it but I see a multicolored mess in my near future. Gosh I want cake now!!! I want to make this for my husband's birthday, but it needs to be bigger. If I make this in a 9x13 rectangular pan, should I double the recipe? If I don't, I'm afraid the cake wouldn't be high enough. I saw this when you first posted it! I have been dying to try it, but I have to find some marzipan eaters to help me :-) Beautiful! All kidding aside, my roommate really likes your recipe. I hope she makes it soon. We think you should have won, though. 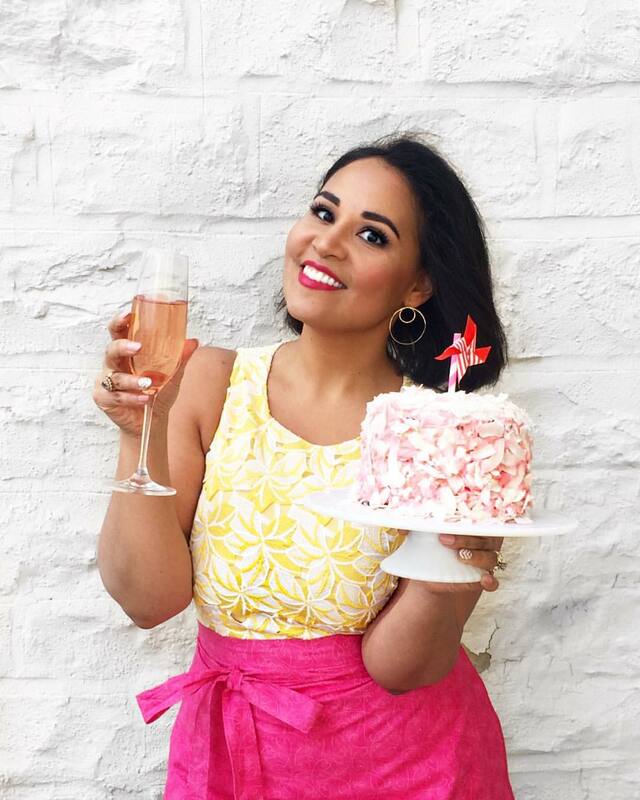 Maybe you should include more photos of you beside the cake? Or would that be too much beauty in one photo? So happy you like my recipe! The amount of food coloring depends on what kind you use, but I've usually found that about 1 to 1.5 teaspoons of each color per bowl works. (That's for the liquid colors.) if you use powdered or gel colors, it'll be slightly different, but I just recommend adding a few drops at a time until you get a color that's just slightly darker than what you want in the finish product. So glad I found this - I make rainbow cookies quite frequently since my son is a huge fan of them as well as many of my friends. They are time consuming but the reward is so worth it. My son keeps asking for his favorite cookies to be a cake. Nows here is my chance to try. Between my recipe and this one - I am sure to come up with one that all will love. By the way I would have voted for u. Love to bake. I want to make this cake for Easter. Can I make it today (friday)or tommorrow and then just frost it on Sunday? Am I better off leaving ir at room temperature for a day or 2 or refrigerating it? Should I assemble it in advance or wait until sunday to assemble it? Yes, you can absolutely make the cake today (friday). 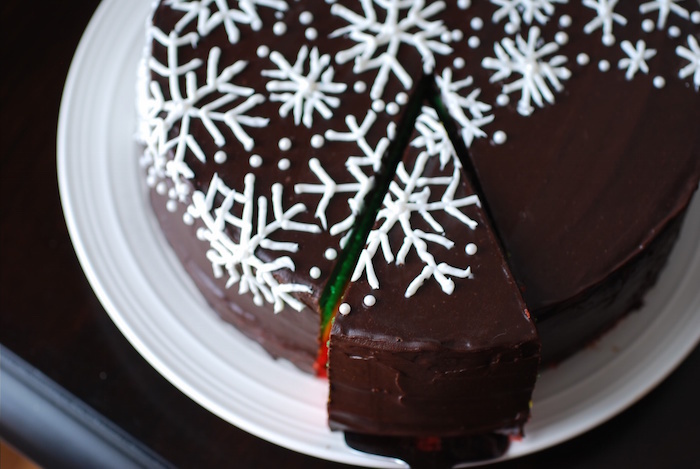 You can even go ahead and frost it today too because the ganache keeps well at room temperature and will actually help the cake stay moist and delicious for when you serve it on Sunday. i've made this cake (assembled and frosted) up to three days in advance before. I actually think it even tastes better because the jam inside has a chance to seep into the cake a bit. Email me at alejandra at alwaysorderdessert.com if you have any questions! I don't think you understand my obsession with rainbow cookies. It hoed beyond ridiculousness hahs. I think. I need that cake in my life now! Do you use liquid food coloring or gel food coloring to dye your cakes? Thank you! My Aunt owned an Italian bakery and she made these all the time. They were my favs since being a child. I married an Irishman and he fell in love with these too when I fed him them when I made them. I always wonder what different people use to dye their bakery. I never thought to do it in cake form but I will do this to surprise my hubby and kids! They'll love it! I also tweak the colors for different occasions!